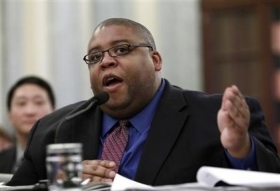 NHTSA's David Strickland: “If the threat to human life is truly imminent, the agency needs to act quickly, and not be slowed down by a lengthy procedural process." WASHINGTON (Bloomberg) -- U.S. auto regulators lack needed power to order immediate recalls under proposed Senate legislation, the federal car-safety chief said Wednesday. The measure, a response to Toyota Motor Corp. vehicle defects, would let regulators require consumer notification of safety hazards and remedies to correct flaws. That “does not constitute a recall,” said David Strickland, director of the National Highway Traffic Safety Administration. “If the threat to human life is truly imminent, the agency needs to act quickly, and not be slowed down by a lengthy procedural process,” Strickland said in testimony at a Senate Commerce, Science and Transportation Committee hearing. Strickland is trying to shape legislation as the Senate and House advance plans to toughen safety oversight in response to Toyota vehicle flaws. The company recalled more than 8 million vehicles worldwide in the past year to address unintended acceleration. The legislation was proposed this month by Sen. Jay Rockefeller, a West Virginia Democrat and chairman of the panel that held Wednesday's hearing. The House is considering a separate plan. Rockefeller's legislation lacks legal protections for manufacturers or standards that would define when the government could take immediate action on defects, according to groups including the Alliance of Automobile Manufacturers. The measure would “significantly expand” federal power over manufacturers, “without offering any additional safety benefits,” said Dave McCurdy, CEO of the alliance, whose members include Toyota, General Motors Co. and Ford Motor Co.
Toyota paid the maximum $16.4 million U.S. fine Tuesday yesterday for failing to alert regulators about a defect tied to unintended acceleration. Regulators said Toyota waited at least four months, violating the law that requires notification within five days. Toyota hasn't found any electronics flaws to explain sudden, unintended acceleration after examining more than 2,000 vehicles, Jim Lentz, president of Toyota Motor Sales U.S.A. Inc., said in remarks prepared for Thursday's House Energy and Commerce Committee hearing. Rockefeller's legislation proposes steps such as requiring standards for vehicle “black boxes” that will record data, brake overrides and floor-pedal placements. The plan increases per-vehicle penalties to $25,000 from $5,000, and removes a fee cap for intentionally failing to report defects. The House version sponsored by Rep. Henry Waxman, a California Democrat, differs from the Senate plan by giving Strickland the power to order immediate recalls. Other provisions in the House version also are in the Senate bill. The Senate's pedal-placement rule wouldn't benefit safety, and penalties should be capped “at some reasonable level,” McCurdy said in prepared remarks. Proposed black-box requirements “will add significantly” to costs of the devices, McCurdy said.